Nightingale House Hospice in Wrexham’s approach has involved installation of a Closomat Palma Vita shower (wash & dry) toilet with touch sensitive switch, and height adjustable washbasin in its day unit bathroom. The move is the result of a desire to help patients, physchologically and emotionally, alongside the core physical therapy. The Closomat is state-of-the-art assistive technology for the bathroom. The ‘smart toilet’ looks like, and can be used as a conventional WC; its integrated douching and drying features cleanse the user without the need to wipe- or be wiped. Explains Outpatient Services Co-ordinator Kay Ryan, “It is our mission to provide specialist, multi-disciplinary care. Having the Closomat allows our patients with complex palliative care needs to maintain a degree of independence, and retain their dignity. It means they are not dependent on their carer or family for intimate help. 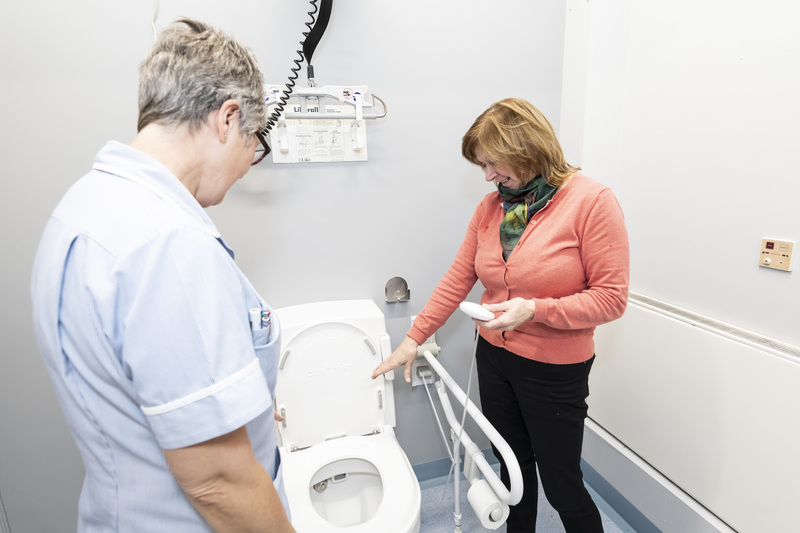 Whilst the Hospice installed the Closomat primarily for its 15 patient day care unit, the bathroom in which it is located is adjacent to the 12 bed inpatient ward, so can be used by them too if required. Closomat was the first company to introduce the concept of shower toilets into the UK, almost 60 years ago. Its Palma Vita is the only unit of its kind developed specifically for disabled people, to enable them to undertake their intimate care with independence, dignity and consistent levels of hygiene. Over the decades, more than 65,000 Closomats have been installed, many of which are still in daily use 30+years since first being fitted. Today, Closomat is the brand leader, with the Palma Vita being the biggest-selling shower toilet in Britain. The Palma Vita is also unique in shower toilets in that it can be ’accessorised’ initially and retrospectively to accommodate changing needs: the touch sensitive switch chosen by the Hospice is one example, enabling people with limited or little strength to still be able to operate the WC on their own. Closomat’s success is largely due to the company’s commitment to customer care by providing, through a dedicated in-house team of engineers, ongoing service & maintenance: Closomat is the only shower toilet company in the UK to manufacture in Britain, and to offer service & maintenance.